The key to understanding any technology is understanding the language of the technology – the jargon. This page is an overview of cabling jargon to introduce you to the language of the technology and help you understand what you will be reading in this section. We suggest you read this section carefully to help your understanding of the rest of the pages and refer back to it when you encounter a term that you do not recognize. 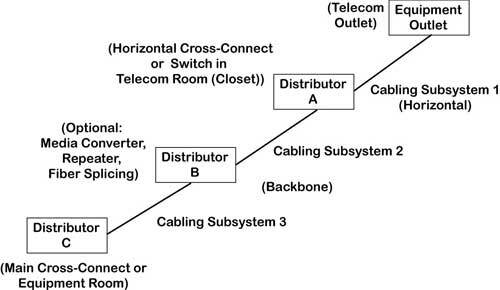 Here's an overview of the basic jargon used in cabling. Premises cabling is the infrastructure for telephone and LAN connections in most commercial installations and even in some modern homes. It's also used for fire alarms, building management, audio and video. Structured Cabling is the standardized achitecture and components for communications cabling specified by the EIA/TIA TR42 committee and used as a voluntary standard by manufacturers to insure interoperability. Structured cabling is based on a number of industry standards - voluntary interoperability standards - developed by manufacturers who want their products to work together. They meet in committees several times a year and decide on the specifications of their products. These common specs mean that equipment will work on any cabling system that follows the standards and most cabling components can be interchanged without adversely affecting performance. EIA/TIA: In the US, Electronics Industry Alliance/Telecommunications Industry Association (TIA), an industry trade association that creates voluntary interoperability standards for the products made by member companies. Worldwide standards rely on ISO and IEC standards. More. EIA/TIA 568: The main standard document for structured cabling, usually referred to as simply "568." It is now on the "C" revision, published in 2009. Worldwide, ISO/IEC 11801 is approximately the same as TIA-568. More. Traditional structured cabling (above) defined in TIA 568 and adopted by ISO/IEC 11801 includes UTP copper cabling and fiber optics, including centralized fiber optics. 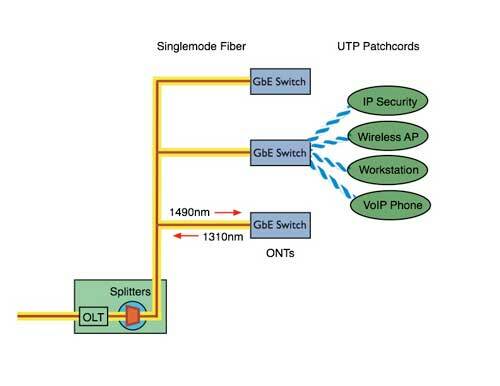 These standards are updated to recognize passive optical LANs (POLs) based on fiber to the home (FTTH) technology (below) using fiber optic passive splitters instead of electronic network switches. The terms listed her are the traditional terms used since the beginning of structured cabling, but a new set of terminology is being introduced. See below or the link. Patchcord: A short length of stranded cable with a RJ-45 plug on either end, used to connect hardware to the link or to connect cables in a Patch Panel. Also a short fiber optic cable use for connections. The Types Of "Low Voltage" Copper Cable. For more information on fiber optic cabling, see the FOA Online Fiber Optic Reference Guide. UTP: Unshielded twisted pair cable, most commonly comprised of 4 twisted pairs of copper conductors, graded for bandwidth as "Levels" (from Anixter) or "Categories" (EIA/TIA 568). Legacy analog phone systems (POTS or plain old telephone systems) used multipair UTP cables with 25, 50, 100, 200 or more pairs. Category 3,4,5, 5e, 6, 6A, 8: Ratings on the bandwidth performance of UTP cable, originally derived from Anixter's Levels program. Category 5e (enhanced) is rated to 100MHz. Cat 6 standards for UTP are specified at up to 200 MHz. Cat 6A (augmented) up to 500 MHz has recently been ratified. Cat 7 is also discussed for the future, but is only standardized as "Class F" in Europe, not the US. 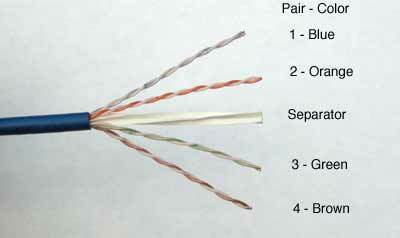 Cat 8 is a new short length cable proposed for data center connections of servers and switches. "Categories" called "Classes" in worldwide standards like ISO and IEC. Cables rated Cat 5 or higher are limited to 4 pairs. STP: Shielded twisted pair, specified by IBM for Token Ring networks and offered by some vendors in higher performance versions than UTP. 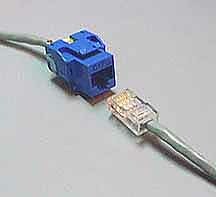 ScTP: Screened Twisted Pair, a UTP cable with an overall foil shield to prevent interference. Fiber Optics:Optical fiber carries signals as pulses of light over thin strands of glass or plastic instead of copper wire. Singlemode optical fiber: small core fiber used for longer distance linkes with almost unlimited bandwidth. Plastic optical fiber (POF) large core plastic fiber used for short, relatively slow links. Coax: A type of cable that uses a central conductor, insulation, outer conductor/shield, and jacket; used for high frequency communications like CCTV (closed circuit TV) or CATV (community antenna TV or cable TV). 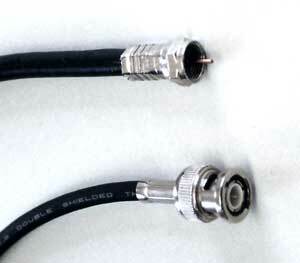 Coax is not included in TIA-568 but is included in TIA-570 for home use. RJ-45: The popular name of the modular 8 pin connector used with UTP cable in structured cabling systems. It is used erroneously, as a connector is only really an RJ-45 if it is terminated with USOC pinout for plain old telephone service. Punchdown: A connecting block that terminates two cables directly, most often used for connecting incoming multipair cables to 4 pair cables to the desktop but occasionally for cross connecting 4 pair cables. 110 blocks are most popular for LANs, 66 blocks for telco, but some installers use BIX or Krone. After installing the cables, they must be tested. Every cable, including Cat 3 for telephones, must be tested for wiremap, but cable certifiers will test for all the parameters listed below. A third type of tester, called a verifier, tests the cabling to see if it will transmit date for specific networks like Gigabit Ethernet. Alien Crosstalk: Crosstalk from one pair in a cable to the equivalent pair in another cable, a problem with Cat 6A. Testing optical fiber is much easier. One need only tests polarity/continuity and the loss from one end to the other, as bandwidth or frequency response is not generally an issue for premises cabling. More on fiber testing. Ethernet:: A 10, 100 or 1000 Megabit per second local area network (LAN) that is by far the most popular LAN. Ethernet:: A local area network (LAN) that is by far the most popular LAN. Versions exist for transmission from 10Mb/s to 100Gb/s. All versions of Ethernet also have fiber optic connection standards. See the chapter on networks. All versions of Ethernet also have fiber optic connection standards. More. Power over Ethernet (PoE): The IEEE 802.3 Ethernet standards committee has established standards for powering devices using UTP cabling. The original intent was to use spare pairs in 10/100 Ethernet links to power devices like wireless access points or VoIP phones but was expanded to use all pairs. The name was not trademarked so it is now used for a number of applications using UTP cabling that includes non-standard applications like powering lights in offices as well as network attached devices. All LANs today include wireless access points. Wireless is by no means wireless, as it requires wiring to connect it to the network. It merely replaces patchcords with a wireless link to allow roaming within a limited area. Wireless requires many access points connected (over wire or fiber) into the backbone. WiFi is the popular name for IEEE 802.11 standard used by most portable computers and many other mobile devices. Bluetooth (IEEE 802.15) is a limited distance network for consumer devices. It has been used to connect a wireless printer or mouse to a PC, wireless headsets to cell phones and stereos, cell phones to cars for hands-free operation, digital cameras to printers, etc. WiMAX (IEEE 802.16) is a further development of wireless network technology that expands the data capacity of wireless and it’s distance capability. Cable Verification Tester: A device that runs network signals over installed cabling to see if the cabling can transmit network data without error. 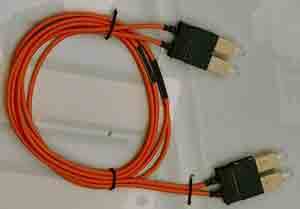 Fiber optics: Testing is done with visual tracers/fault locators, optical loss test sets and OTDRs. Here is more information on fiber testers. UTP Cables Power Over Ethernet.